Los Angeles: Black Sparrow Press, 1974. First Edition. Hardcover. Very Good. Signed. First edition. 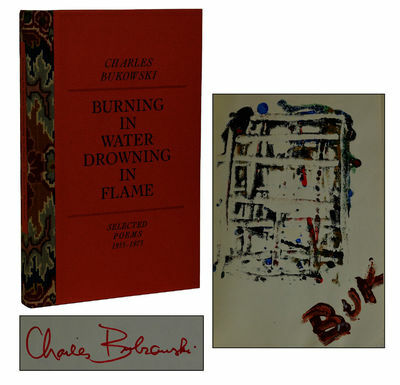 One of limited 50 numbered copies with an original painting by Charles Bukowski tipped in, signed Bukowski on the limitation page, and hand bound by Earle Gray. Lean to spine, and light water affect to bottom edge of front pages, else Fine. In acetate jacket with one short tear near spine joint, and light rubbing. An important poetry collection of the hard-drinking L.A. poet, signed and with his original art work.